There are so many “rules” writers are supposed to follow, it becomes exhausting to try to read and follow them all. Especially for new writers it can be so easy to look up all the writing rules and try desperately not to make a mistake. Sometimes though your creativity can be stumped and let’s be honest, rules are made to be broken right? Some rules are necessary like showing not telling although from my own experience this can be tough to get right or word counts – don’t send an agent a 200,000 word novel and some are there because some things have become cliches like beginning your novel with your main character waking up. But even so, there are exceptions out there. Divergent by Veronica Roth, for example, is a book I loved and has been really successful – look out for the film version soon – and it opens with the main character looking at herself in the mirror – one of the no-no’s if you read the “rules”. It works in Divergent though because the character is only allowed to look at her reflection when her mum cuts her hair once a year – straight away we know she’s in a different world and we’re intrigued about it. Technically, Ms Roth broke a rule though. In my own book, I have broken one of these “rules” by using flashbacks. A lot of writing tips sites and books say not to use this device but it’s in there and my agent even encouraged me to add more of them. If I’d listened to and followed the rules out there, I may not have written the same book. I suppose this post is a rather long-winded way of saying that your writing (and social networking) needs to be your creation, you need to find and express your voice in the only way you can and this might mean breaking some of those writing “rules”. I don’t think any truly successful book has ever got to that point by being quiet – they’ve got there by being different and shouting about those differences. 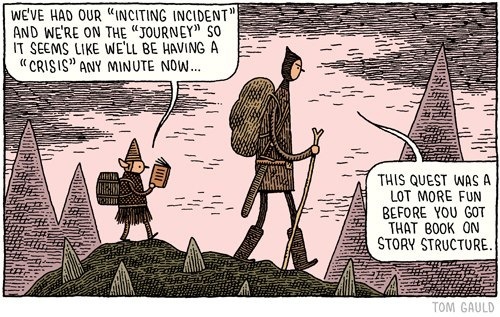 Even if you think they’re badly written (naming no names here but you can guess) they’ve made a splash and I think if you want to, you need to follow your own path. What do you think about writing rules? Have you ever broken them? I think we need to understand them first then do what we think matters to our story. Great post good luck with your writing. Yep, obviously you don’t want an agent or editor to just dismiss your story because it’s all over the place but you also don’t want them to dismiss it because it’s the same as every other book out there. I think you have to follow your gut instinct in the end. Thank you! Great post! I always liken “writing rules” to the pirate’s code – more like guidelines. It’s true – we need to focus on being creative. I definitely think writing a book you’d like to read is good advice! Damn straight! I actually love reading about flashbacks in books so I’m not sure where the dislike of them came from. Obviously it’s not good if you have an excessive amount of them, but their one of my favourite story devices as a reader! I love the Facebook pic. I think that knowing the rules is important in some ways, not because they need to be followed, but because its good to break them with intention. I think they’re more like…guidelines. lol. I think Jack Sparrow said it perfectly. =) We do have to know them to know when to break them. But you’re right. Just tell the story that needs to be told, get it looked at by other people, and fly from there. And about twitter…during my book launch I was afraid that any new followers would think I was full of myself. Every other tweet was me guest posting somewhere, talking about my book, excited. I realized that’s okay. Readers should be excited for you during this time of your life. The momentum shifts with the person. 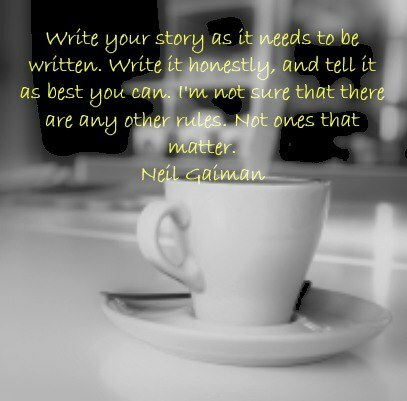 Love the Neil Gaiman quote. When I first started writing/editing I tried to follow all the “rules” of setting up a freelance business but got so overwhelmed by all the information. Sometimes you just need to choose what works for you and leave the rest. There is so much out there, you’d go crazy if you tried to follow it all – I think you did the right thing, it’s cheesy but you have to go with your gut! YES! Such a good point! I think learning the “rules” is very important. It is equally important to write, write, write with reckless abandon, learn our own styles, and figure out how to break the rules we must to keep our individuality and edge without making the craft fall apart. Love the cartoon at the top. Re the rules, I started writing by instinct and have been picking up a few rules along the way. I think gut instinct in writing is important!